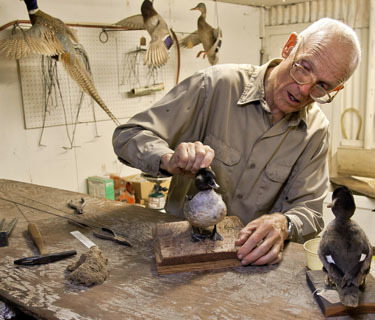 Master taxidermist Richard Gurnee will be on hand Saturday when UCSC's Museum of Natural History Collections opens its collections to the public at the Science and Engineering Library. 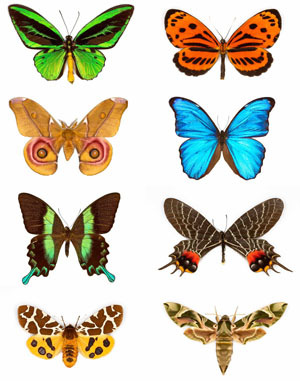 The open house will feature a display of the Gerhard Ringel butterfly collection. UCSC students are encouraged to attend for free on Friday, Nov. 18 from 11:00- 3:30 p. m. The public is invited to attend Saturday Nov. 19 from 12:30-5 p.m. with a suggested donation of $5 for adults. All donations will benefit the museum, said museum curator Chris Lay. Free parking will be available on Saturday at th¬e nearby Core West Parking Structure. Lay said the theme for this year's open house is "from master to apprentice." The museum will highlight the contributions of two local master naturalists: Randall Morgan, a 1970 UCSC grad, and Watsonville's expert taxidermist Richard Gurnee. Both will be on hand on Saturday. Morgan’s plant and insect collections are the centerpiece of the museum and provide an invaluable resource for understanding local biodiversity and a unique opportunity for further research into plant/pollinator dynamics. For many years, Morgan has generously shared his wisdom with MNHC staff and many UCSC undergraduate and graduate students doing local ecological research. Gurnee, a taxidermist for more than 50 years, invented the freeze-dry technique in the early 1960s to preserve birds, mammals, reptiles, and other specimens. "If you’ve ever been to the Santa Cruz Museum of Natural History or many of our state park visitor centers, you’ve seen his incredible work," Lay said. Gurnee still produces beautiful specimens for museums across the country and has been teaching his skills to MNHC staff and student interns, Lay said. Also on display will be fresh fungus specimens, butterflies and moths from around the world, mammals, birds, and reptiles, and graduate student research involving the collection. The museum was established in 1996 as part of the Environmental Studies Department and is the main repository for natural science collections at UC Santa Cruz. The collections include plants, fungi, lichens, marine algae, insects, fish, amphibians, reptiles, birds, mammals, and skeletons, for use by researchers, teachers, students, and the public. The museum is actively cataloging and expanding its collections and is involved in many internships, research projects, classroom laboratory exercises, and cooperative ventures with other organizations. The collections are organized for research and classroom use, but the museum has opened its collections for public view once a year since 2009. Funds raised from this event will be used to expand the museum’s work on Morgan’s large insect collection. More information is available at mnhc@ucsc.edu or 459-4763.